A lot of research has gone into the benefits of plants and human health. Studies have mixed results about the benefits, ranging from increased productivity in the workplace to only benefits for men or women. But none of these studies have found evidence of negative outcomes to having indoor plants. Research shows that there are many benefits to adding indoor plants to your home or workspace. These include happier moods, better job satisfaction, and stronger relationships. In many cases, it’s recommend to have one potted plant per 100 square feet to feel the benefits. Or you can get plants tailored to your needs, like removing formaldehyde from the air. Plants are nature’s first air purifier. They can help remove dangerous compounds from fuels, furnishings, and clothing. Studies found that students had a lower heart rate after seeing green spaces. This suggests that pictures of nature can help with stress recovery. You can receive similar benefits from indoor plants by going outdoors. One study has found that having 10 more trees in a city block increases happiness almost in the same way that a $10,000 raise does. For most people, the risks of adding plants to indoor environments are low. Certain plants may be less likely to trigger your allergic symptoms. It’s important to note that some plants are toxic to pets and children. Ask your doctor about which indoor plants are a safe choice if you have a history of allergies. 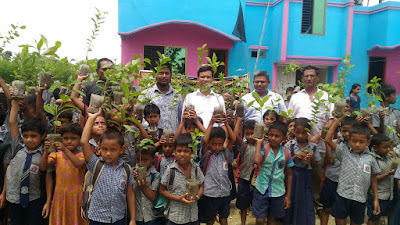 Why you will plant Tree?